Lyranth the Foolkiller is a powerful Dremora and a prominent member of Foolkillers Clan of Coldharbour. She serves Molag Bal, and views him as the true master of all Dremora. At some point, Lyranth was banished from Coldharbour after the betrayal of Deathbringer Clan, which then rose to prominence in the realm. However, the vestiges of her fellow Foolkillers were trapped by a Grievous Twilight named Dusk and humiliatingly incorporated into a set of armor. In 2E 582, the Aldmeri Dominion invaded Black Marsh in an attempt to exterminate the Argonians and conquer the region of Shadowfen. The invaders summoned Lyranth from Oblivion and bound her inside the ruins of Ten-Maur-Wolk, an ancient site of Daedric worship. The expedition leader, an Altmer alchemist named Ruuvitar, discovered a method to transform his soldiers into doppelgangers. These skin-stealers were created by using Hist sap to steal the victim's memories, and using Lyranth's essence to create the physical illusion. However, the Dominion occupation of Ten-Maur-Wolk was soon noticed by the Ebonheart Pact, and Ruuvitar's forces were driven off after the Battle of Ten-Maur-Wolk. During the battle, Lyranth was discovered by the Soulless One and offered to reveal Ruuvitar's plans and help drive off the invaders if freed. It's unknown if this offer was accepted, but Lyranth escaped her prison regardless. Once freed, Lyranth began an attempt to fulfil an oath of vengeance against the Deathbringers on behalf of her dishonored clan. Her first step was to free the trapped vestiges of her clanmates from their imprisonment at the hands of Dusk. The Grievous Twilight had been appointed Lord Warden of the Imperial Prison following the Daedric occupation of the Imperial City. Lyranth allied herself with a group of Undaunted who had come to brave the dangers of the prison, and guided them through the complex to a final confrontation with Dusk. After the mortals defeated him, Lyranth trapped his vestige in a shield as vengeance and gave it to the adventurers. She then freed her clan from Dusk's armor, allowing them to return to the Void. 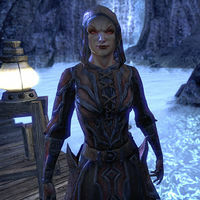 Although she assumed control of the prison on behalf of Molag Bal, Lyranth didn't remain long and eventually returned to Coldharbour to continue her vengeance. Soon afterwards, a mortal expedition from Tamriel entered the realm to stop the ongoing Planemeld. After being split up by Molag Bal's magical defenses, a large group of invaders from the Fighters Guild ended up trapped in the Tower of Lies, a great pit where prisoners had their minds clouded and were forced to dig. Unaffected by the mind clouding, Lyranth watched the invaders, and eventually offered her aid when the Soulless One came to rescue the group. Under her guidance, the mortals banished their Daedric overseers and escaped the pit. Lyranth later approached Vanus Galerion when the invasion was blocked by the Reaver Citadel, the Dremoras' last line of defense. By outlining the citadel's weaknesses, Lyranth allowed the invaders to storm the Daedric defenses. In order to disgrace the Deathbringers further, Lyranth sent the Soulless One to banish their leader Valkynaz Seris in the heart of his power, a giant fortress known as the Pyramid. With his death, the Foolkillers were returned to power in Coldharbour, and in return Lyranth opened the way to the Endless Stair, allowing Meridia and her mortal champions to destroy the Planar Vortex and end the Planemeld. Lyranth's paleonymic is Wehkehpneht-kamdo. She views most other Daedra with disdain, although she sees the Xivkyn as potential allies. This page was last modified on 21 October 2018, at 08:16.